Inviting for rock climbers I would think. So I set off to hike the Failmore horseshoe with three buddies of mine recently for the first time. 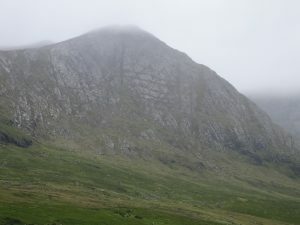 It was a typical west of Ireland summer day with liquid sunshine, (also known to others as rain) threatening to start, while the sun was battling just as hard to chase it away and neither winning out. But it was warm, pleasant and I was in good company. The parking spot was a bit tricky to find, hid away as it is and the navigator really had to be on his toes to guide us in. Grid ref L 926:524 on the OSI series maps, sheet 38. The whole place just seemed ancient and timeless, and the only sound to hear was the Failmore river which gives the horseshoe its name and the ravens at play, maybe the odd Meadow Pipet. 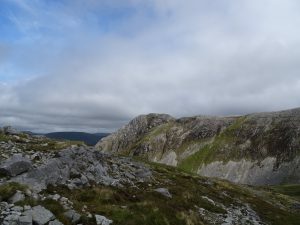 This hike takes in a part of the Maumturks mountain range which runs for twenty mile from Maum Cross in the south to Leenaun in the north. The Maumturks challenge is run along the length of this range annually and is one of the best known and toughest one day challenge hikes and attracts great numbers each year. Not all will complete it as what makes this hike so tough is both the weather so normal to this part of the world and the rough terrain. This area has also always been a very holy place where people would go on pilgrimage dating back to pagan times. 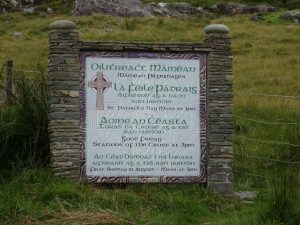 They’d come up here to be closer to god and it’s been said St Patrick climbed up here to bestow his blessings on the Connacht country side. People still gather here to this day three times a year, St Patricks’ day, Good Friday and the first Sunday in august to do the Stations of the Cross, prayers and drink Poitin and stuff. 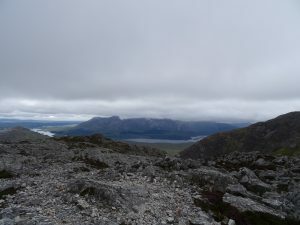 There’s a terrific view from the summit here and at 702 M according to OSI, and the highest peak in the Maumturks range you can see on a good day the magical sights of Inagh Valley and Twelve Bens to the west, Joyce Country and the mountains of south mayo N/ NE. It was up to us though to not get too carried away with all this history as we were moving in and out of thick cloud and had to focus on navigating and where we were putting our feet. The terrain is really rough in parts and a mistake in the wrong place has the potential to be quite serious with some near vertical drops in places. 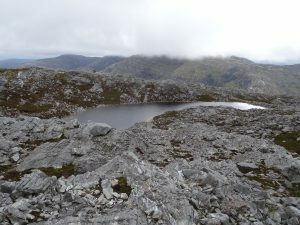 Plenty of hidden gems in the form of mountaintop lakes like the un-named one in the pic above, popular within certain circles for summer swims when the weather’s fine, or the more adventurous when the weather’s not so fine and it’s not necessarily summer. Think I might take this up in 2017. You can clearly see where the path is well worn from thousands of pilgrims and hikers over the years but this was leading us away from our intended route down into the col, but on hindsight I think it may be better to follow this down to Lough Maumahoge before looping back on our second leg of the route toward home. 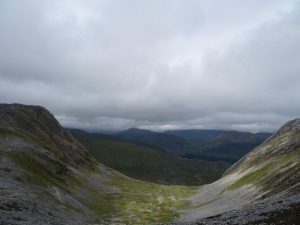 The descent here at around grid ref 885:535 into the col is extremely steep and rough with potential ankle breaking traps all about the ground in the form of scree, rock and boulder. Visibility like we had this day this makes it worse again and also wet and slick in parts. Still if you just take it slowly here you should be fine. 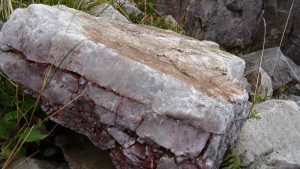 The whole area too would see most geologists satisfied with the schists and quartzite all round in varying shapes, sizes and colours. So once down in the col there’s not really that much left. A slight gradual climb but we’re on the back straight and it’s mostly downhill all the way back to the car and we can almost taste the fish’n chips we’re gonna have back in Wesport. I feel like we’ve earned em. Duration of hike was just under 8 hours with snack stops and navigating, with a total climb and descent of 817m over a distance of 12k.